From wedding celebrations to relationship disillusionment, 3 Women is razor-sharp, funny and caustically irresistible. 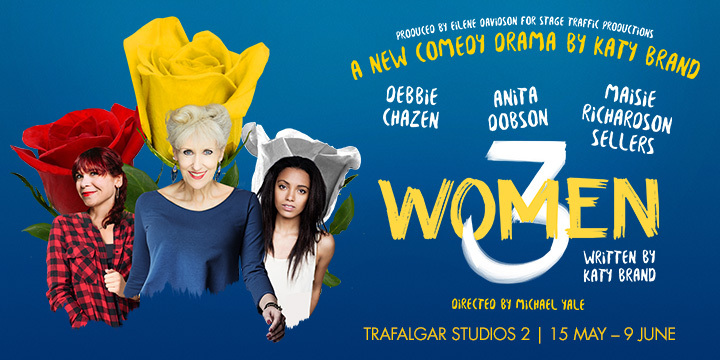 3 Women, the debut play by the award-winning comedian and writer Katy Brand, will premiere at Trafalgar Studios 2, starring the celebrated screen and stage actress Anita Dobson (Eleanor), alongside Debbie Chazen (Suzanne), Maisie Richardson-Sellers (Laurie), and Oliver Greenall (Waiter). Running from 15 May to 9 June 2018, with press night on 18 May, 3 Women explores the relationships between three generations of the same family, brought together in one hotel room, in a darkly comic and pertinent exploration of what it means to be a woman.